Hon. Megan Wagner, OC Superior Court: View From The Bench, Protections To Be Aware Of. 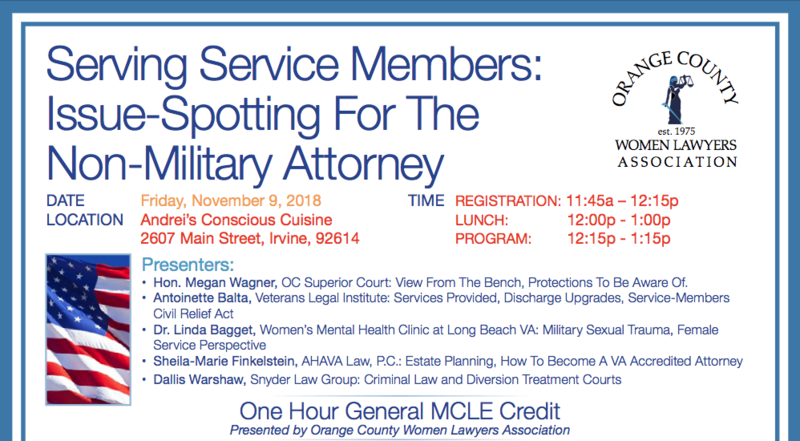 The purpose of this CLE is to give the attorney with little or no military experience/ understanding a brief introduction to some of the various legal protections and issues specific to our military and veteran members, with particular attention to the female service member perspective. The goal is that practitioners determine if their clients are service members and entitled to additional protections in their particular practice area, and to understand that there may be additional obligations and responsibilities in representing service members. The presentation includes a catered lunch.